February is National Bird-Feeding Month in the United States. It was established in 1994 at the request of John Porter, an Illinois congressman, to educate the public on wild bird feeding and watching hobby. February is one of the most difficult months for wild birds, and providing food and shelter will help their survival. 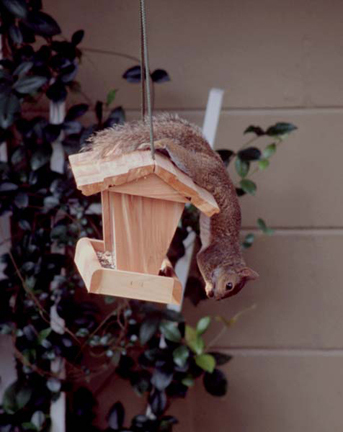 Approximately one-third of the United States adult population feed wild birds in their backyards. The song turned out to be one of Walt Disney's favorite songs. It was written by the Sherman brothers, Richard and Robert. When they played and sang it for Walt Disney, he said, "That's it, isn't it? That's what this is all about. This is the metaphor for the whole film". It is why Mary Poppins came, to teach the children, and Mr. Banks, the value of charity. There is a story about Richard Sherman's appearance at Disney's Centennial dedication of the Walt Disney statue at Disneyland, the "Partners" statue of Mickey and Walt Disney holding hands at the Magic Kingdom. He was asked to play some songs. Before playing his last song, Sherman said, "Now I'll play Walt Disney's favorite song, and it's just for him", and he played "Feed The Birds". Sherman was later told that "just toward the end of the song, out of the blue sky one bird flew down where he was playing, and then back up into the clouds". Sherman believes it was Walt. Disney and got emotional when remembering the event. We give you "Hyde Park Heist" taken in Tampa, Florida. While there is no bird on the feeder, it was meant for wild birds. However, this agile and determined thief took a large leap from a nearby tree and hung on for his snack. Next, is "Air Meal". 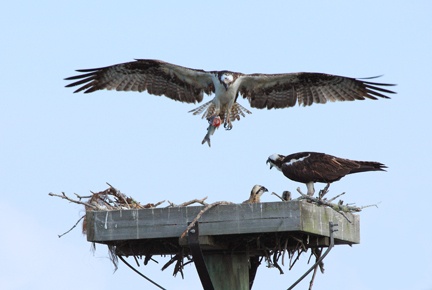 While we have nothing to do with feeding these ospreys, we would like to offer it as a monthly special. It was taken in Bonita Springs, Florida. The mother bird was calling loudly for her mate. Eventually he arrived with dinner, having had a snack along the way. Note the fish's missing head. Stop by and see us on Monday through Friday from 10a.m. to 12 noon and 2p.m. to 5p.m.